Gavop studied the growth rates of the top ten home purchase mortgage lenders in Los Angeles and found that First Republic Bank tops the list with a growth rate of 164%. The loan origination's for First Republic increased from 215 in 2015 to 568 in 2017. HomeBridge Financial Services Inclusive is second on the list, with a growth rate of 142%, from 307 loan origination's in 2015 to 744 in 2017. It is followed by Shore Mortgage with a growth rate of 131%; their 347 loan origination's in 2015 increased to 803 in 2017. For this study, Gavop sourced data from the latest Home Mortgage Disclosure Act (HMDA). Of the ten mortgage lenders analyzed, Nations Direct Mortgage LLC has the lowest growth rate, as its loan origination's fell from 656 in 2015 to 472 in 2017, resulting in a 39% decrease over 3 years. It is followed by Wells Fargo Bank, National Association with 22% decrease in the last 3 years, as its loan origination's declined from 1,864 in 2015 to 1,525 in 2017. A citywide comparison of the total number of loans originated in Los Angeles showed a 13% decrease from 69,058 in 2015 to 61,403 in 2017. However, in the state of California, the number of origination's increased by 11% from 348,963 in 2015 to 388,577 in 2017. Gavop also ranked the top 10 home purchase mortgage lenders of Los Angeles in order of the number of loans originated in 2017. JP Morgan Chase Bank is at the number one position with 1,718 origination's in 2017. Interestingly, Wells Fargo Bank, National Association is at number two with 1,525 origination's in 2017, despite a 22% decline. Bank of America, National Association follows at number 3 with 1,329 loan origination's in the last year. 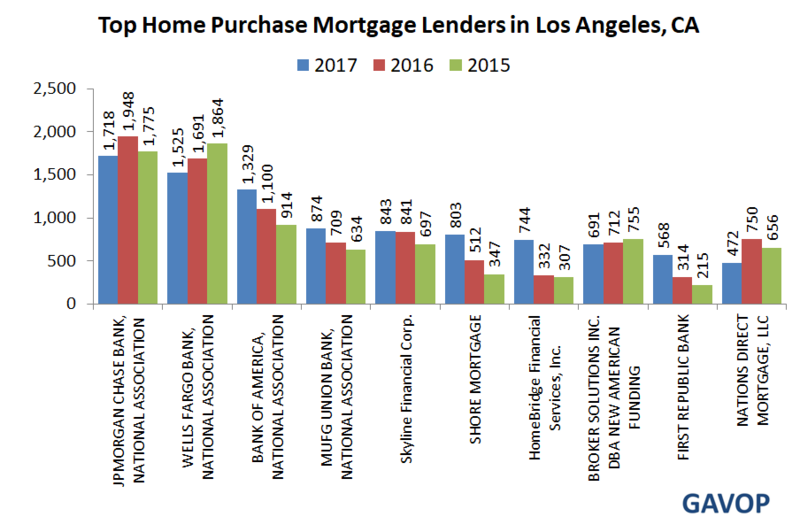 The following graph shows the home purchase loan origination's of the top ten lenders in Los Angeles for the last 3 years. The top 10 loan lenders account for around 40% of the home purchase mortgage loans in Los Angeles, California. If arranged in order of their compound annual growth rates between 2013 and 2017, HomeBridge Financial Services Inc. shows the highest growth rate at 36.0%, followed by Nations Direct Mortgage, LLC at 24.3% and Broker Solutions Inc. DBA New American Funding at 23.3%. Wells Fargo Bank National Association shows a negative growth of -8.5% in this period. MUFG Union Bank National Association at 2.5% and JP Morgan Chase Bank National Association at 3.0% follow with the lowest growth rates. For more details & data on Los Angeles-CA Mortgage Lenders, click on this link.